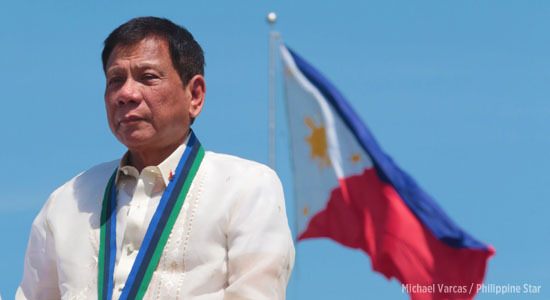 MANILA -- President Rodrigo R. Duterte is “frustrated” that despite efforts to make his war on drugs “harsher” than ever, the entry of illegal drugs in the country still persists, Malacañang said on Thursday. Presidential Spokesperson Salvador Panelo made this remark after the President said, during a PDP-Laban campaign rally in Malabon City on April 2, the drug problem has worsened because of the involvement of government officials, including police and military. “Napu-frustrate siya kasi nga despite lahat ng ginagawa niya ay may nakakapasok pa rin (He is frustrated because despite all his efforts, the entry of drugs in the country is continuous),” Panelo said in an interview over DZMM radio. Panelo cited how some law enforcement officials have already been relieved for having a hand in the illegal drug trade. “Alam ni Presidente iyan, ‘di ba naglabas nga siya noon ng mga listahan niyan - nung mga kasama diyan. (The President is aware of this, that’s why he has released a list of those involved in the drug trade),” Panelo said. Meanwhile, the Philippine National Police (PNP) has already expressed support for Duterte’s decision to release the list of narco-cops. “Nakahanda ang PNP na imbestigahan lahat ng mga pangalan ng mga aktibong pulis na mapapangalanan ng ating Pangulo (The PNP is ready to investigate all names of active police who will be named by the President),” PNP spokesperson Col. Bernard Banac said. Banac also reminded police personnel to stand by their mandate to serve and protect the people and steer away from illegal activities. He said the PNP has been conducting internal cleansing program meant to weed out scalawags and restore the pride of uniformed personnel.